On a cold winter morning, the reception area in the newly renovated Henry and Lois Foster Hospital for Small Animals bustles with pets and their owners, many of whom have traveled a long way to see the veterinarians at Cummings School. 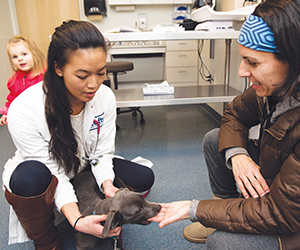 Carroll Ho, from Long Island, New York, confers quietly with Caitlyn Little, a fourth-year veterinary student, about how they will aspirate a lump beneath the fluffy white coat of her Maltese terrier, Gabby. 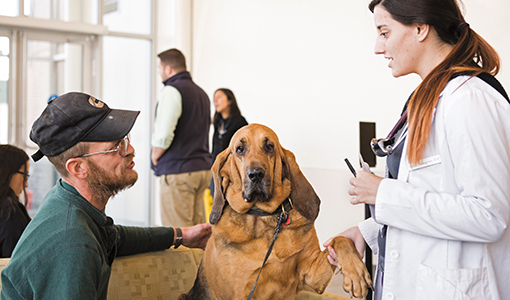 Jeff Doyle, from West Brattleboro, Vermont, strokes Butter, a soulful-eyed, 9-year-old bloodhound with lymphoma who’s come for his outpatient dose of chemotherapy. Robert DeSimone and Gloria Cipriano, of West Warwick, Rhode Island, sit with Tessie, their 13-year-old kitty being treated for chronic inflammatory bowel disease and a thyroid disorder. Peeking out from her carrier, Tessie seems content in the hospital’s main reception area, but her owners appreciate the fact that there’s also a separate space for cats that get skittish in noisy places and do better in a more private, quiet space. 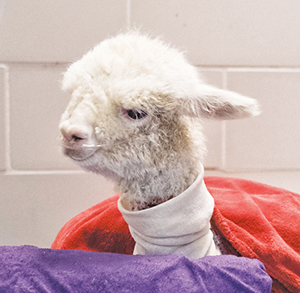 Polar Light, a baby alpaca, recovers in the intensive care unit. The Foster Hospital was designed to handle 12,000 patients a year when it opened in 1985; now more than 34,000 pets visit the hospital annually, many of them with life-threatening health problems that require advanced care. It is the veterinary equivalent of a major teaching hospital for humans, a place for the sickest of the sick. Several previous renovations helped address the demand for top-flight care, including the expansion and renovation of the emergency and critical care wards and surgical facilities in 2003 and the addition of an MRI wing in 2007. The most recent, a $10 million project, got underway in 2015, thanks to support from generous donors. 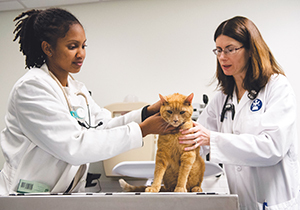 The “new” hospital, which has been expanded by 15 percent, including five additional exam rooms, will enable Tufts veterinarians to handle their growing caseloads and reduce wait times for animals needing specialized care. “I’d come here myself if I could,” Cipriano said. A new Reflection Room offers a serene place where families can say goodbye to their companions in a home-like setting. Pet owners can enter and leave the room without having to walk through the rest of the hospital, a blessing for those in an emotionally fragile state. A reflection garden planted outside will offer another place for quiet contemplation. Kendra Cestone, whose family lost their 10-year-old dog Rookie to lymphoma last October, says this quiet space and the caring staff made a difference. “Two members of Rookie’s oncology team met us at the door and took us straight into the room,” said Cestone. “As hard as that trip was for us to make, the entire staff made it an unforgettable experience for us in a completely different way than what we had expected. They made us feel so special and made Rookie feel like she was the only dog on the planet.” Now Cestone, above right, has returned to the Foster Hospital for a first checkup for her family’s new puppy, Lula. Christine Yee, V17, greets the pup; Cestone’s 2-year-old daughter, Taedyn, is behind her. 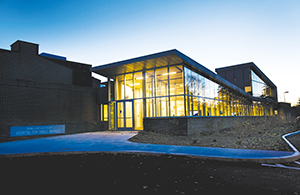 “The new facility is fantastic, but it’s the people who make the place,” Cestone said. Veterinary neurologist Dominik Faissler is among those specialists. On this morning, he and fourth-year student Dan Shaiken greet Haggis, a 9-year-old Scottish terrier named for the traditional Scottish pudding; he sports a plaid collar and leash. In February 2014, Haggis was diagnosed with myasthenia gravis, a life-threatening disorder that disrupts signals between the nerves and muscles, causing muscle weakness and fatigue. The disease initially attacks the esophagus, rendering it incapable of pushing food and water into the stomach and causing regurgitation that can lead to aspiration pneumonia. Haggis was put on medication to improve his neuromuscular transmission, and for six months, his owners, Graeme and Jennifer Cosh, had to feed their dog by hand and then keep him elevated for 30 minutes. Surviving this disease for nearly three years is “absolutely great,” Faissler tells Graeme Cosh, whose burr indicates his own Scottish heritage. Faissler literally rolls out the carpet for his patient—a heavy-ribbed black mat that gives Haggis even more traction than the textured floor of the exam room. One of 21 exam rooms that have been redesigned, it includes a computer on a movable desk that enables Shaiken to take notes and access medical records on the spot. Self-assured Max strutted into Katie Hamilburg’s life 12 years ago. Now, he is experiencing lameness in his left front leg, but he confidently roams the exam room, finally making himself comfortable under an upholstered bench. It’s unclear whether the lameness is a recurrence of the cancer for which he was treated five years ago or something else. “I want to do what is best for him. I absolutely won’t let him suffer,” Hamilburg said. She agrees to leave him overnight for further tests, warning veterinarians he nips, a caution that doesn’t faze anyone. The testing discovers that the cancer has returned. After a thoughtful conversation with internist Orla Mahony, above right, and Camille Barnes, V17, above left, Hamilburg decides to take Max home on comfort measures that will enable him to enjoy life a bit longer. “The key to a good neuro exam is a relaxed dog,” Faissler said, as he gently manipulates Haggis’s legs. “You can’t see nuanced signs if a patient isn’t calm,” which is why he checks animals’ reflexes while they’re standing instead of lying down, when they may feel more vulnerable. Faissler likes what he sees, but recommends a consultation with a veterinary dermatologist to be sure that Haggis’s new paw-licking habit doesn’t indicate a skin problem. The Scottie did have a skin infection, treated by an antibiotic and bathing his paws in a medicated shampoo. Karen Greco has brought Brutus, a 10-year-old Boston terrier with cancer, in for a checkup and bloodwork. Brutus has mast cell tumors, the most common skin cancer in dogs, and Cushing’s disease, an endocrine disorder caused by a tumor on the brain’s pituitary gland. Both conditions are being treated with radiation therapy. A third of the Foster Hospital’s cases come through the emergency service, said Armelle de Laforcade, V97, the associate medical director who oversees the ER. “We want to make the experience at the ER a good one, as good as an inherently difficult situation can be,” she said. The new hospital lobby features a dedicated ER check-in so critically ill animals can been seen quickly, and the ER treatment area has been expanded. In the new ER space for rounds, clinicians can discuss cases, confer informally or just take a few minutes to decompress from the intensity of emergency care. It features expansive glass so that caregivers can see what’s happening in the ward. Large monitors display real-time information on emergency cases—where patients are, the veterinarian assigned and whether they have been transferred to another hospital ward. On afternoon rounds, the ER team gathers around a big table with notes and laptops at the ready. They consider the best course for Porter, a young cat who collapsed at home and was found to have a tumor on his stomach wall. Someone quietly recalls an unexpected death the night before. Another clinician shares the happy news that a shar-pei suffering from a fever is better and can probably go home. 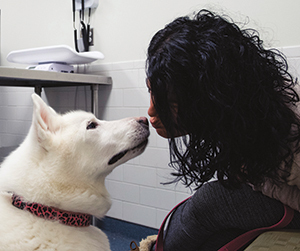 Kristen Quaratella reassures Whisper, her 12-year-old Siberian husky, during a neurology appointment. Also heading home that afternoon is Whisper, a 12-year-old Siberian husky. 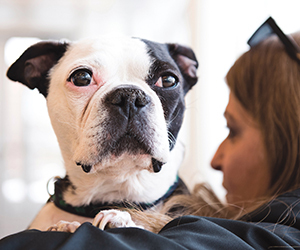 She and her owner, Kristen Quaratella, made the 80-mile drive from Groton, Connecticut, to see Faissler, the neurologist, for a second opinion. Whisper is so weak in her hindquarters that she can’t stand without a harness. The husky’s heightened anxiety during the drive to the hospital caused her to urinate and soil her snow-white coat. Daniel Shaiken gently cleaned Whisper as Faissler and Quaratella talked about the potential causes of the dog’s weakness. Is it a spinal cord disease common in older dogs, or a tumor pinching a nerve? An MRI would be the next logical step, but Whisper has an irregular heartbeat, so the sedation required for an MRI could be risky. A cardiology consult that afternoon confirmed the dog was not a candidate for an MRI. The consensus: Put Whisper on a higher dose of her heart medication so clinicians can continue their diagnostic detective work. Quaratella agreed and heads home. There is no certainty, but there is a plan. A wall of glass provides a striking new entrance to the Foster Hospital for Small Animals. Upping the dosage did help stabilize Whisper’s heart in the days that followed. An advanced blood test detected parathyroid disease, caused by a nodule hidden on one of the two small glands next to the thyroid gland. Such tumors, while unlikely to spread, cause the body to produce too much calcium, which can contribute to both muscular weakness and an irregular heartbeat. Just 10 days after surgery to remove the tumor, Whisper is markedly better.